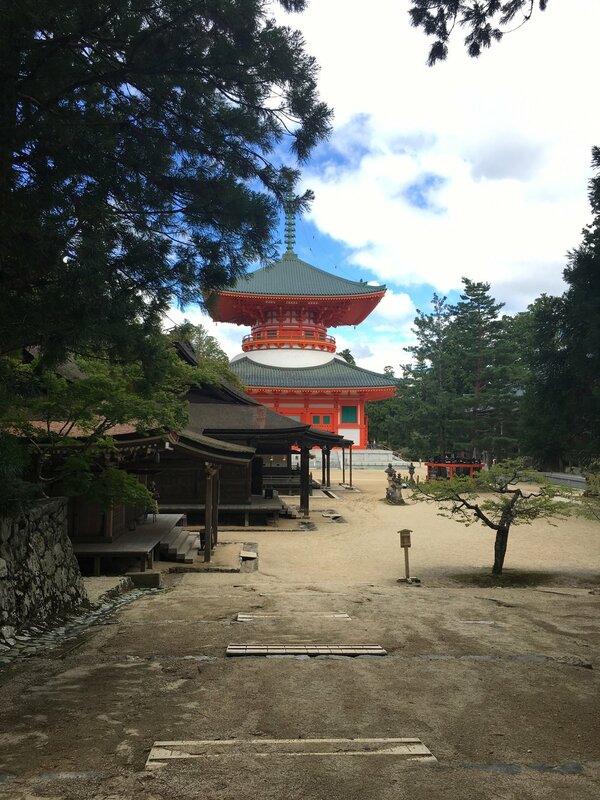 Japan has beautiful spiritual sites, some are more famous, others are off the beaten path. The best way to see Japan is the Japan Railway Pass you can take all the JR trains in Japan included the high-speed Shinkansen (not valid for local trains). You have to book it in advance and they send you the reservation by mail. Our destination after Tokyo was Mt. Fuji. Summer is not the best time of the year to see the mountain. We personally love the heat so we were happy to be in Japan in September but if you are there in this period you should know that your chances of seeing the mountain are reduced to a small twenty percent. From Tokyo make your way to Shinjuku Station and go to the ticket office with your Japan Railway Pass reservation to get the physical tickets. Take the train to Otsuki (JR) then you will pay for a local train to Mt. Fuji Station. There you'll find a local bus that will take you to your final destination. There are five lakes that offer different views of Mt. Fuji. Lake Yamanakako is less touristy. Wake up to see the sunrise and if you are lucky you’ll see Mt. Fuji. We weren't lucky this time. The top was covered by the clouds but the sunrise was beautiful. Guesthouse Hiiragi. We had a private room with shared bathroom and the hosts were lovely. When you leave Mt. Fuji take the fast train Shinkansen (JR) from Mishima Station (bus will take you there from the lake). You can go directly to Kyoto or in our case Nara (local train from Kyoto). In Nara, we stayed at Guesthouse Naramachi. It's a basic accommodation with bunk beds (they also have private rooms if you want to spend a little more). There are set times for check in and the use of shower times and lobby. That's the reason why the stay is cheap. Apart from that, the house is clean and the hosts are helpful. A couple of friends recommended the UNESCO World Heritage Site Koyasan, a monastic center for Esoteric Buddhism built 1,200 years ago. We decided to make our way there despite the long trip. The cemetery built in the forest is incredibly beautiful. You can take your time and wander until you reach Okunoin Kobadaishi Gobyo (sacred shrine - no photos). The spirituality of this place is palpable and your soul will find peace and relief. Curiosity: the graves are composed of five stones representing the five elements: earth, water, fire, wind, space. The Danjo Garan Complex is another area of Koyasan worth visiting, the temples are impressive. From Nara, you have to take 3 trains (JR to Takada or Oji then to Hashimoto and after that local train to Gokurakubashi Station). When you arrive a cable car will take you to Koyasan and a bus to the town center (at Hashimoto you can purchase ticket valid for train + cable + bus). Back to Nara, take your time to wander in Nara Park. You will see hundreds of deer populating the park. You can get really close and pet them. They don't mind but please be respectful. 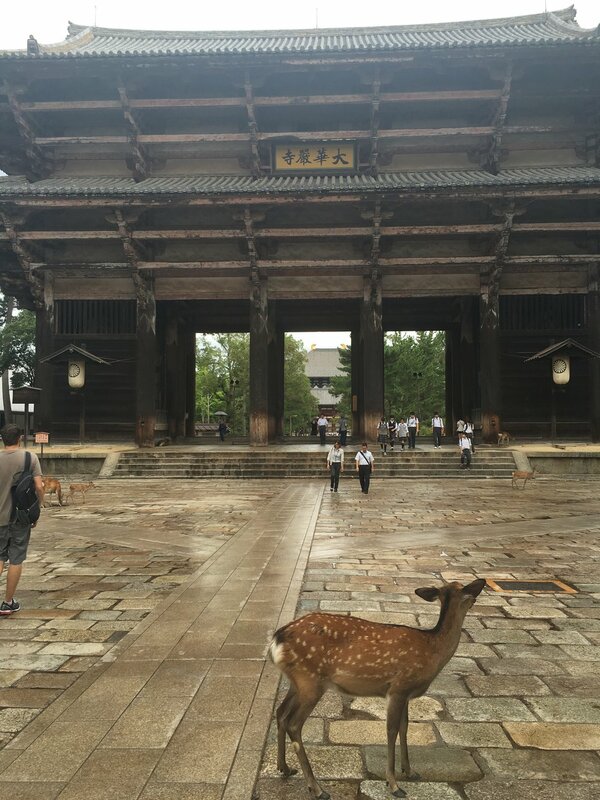 Depending on how many days you have in Nara you can decide the areas you want to visit (there is a lot to see). There are 3 temples in the park (east side) and more temples plus the Palace Site on the west side of the city (take a bus). Must see: Todaiji Temple. It's the biggest wooden building in the world and the statue of the buddha inside is majestic. I'm not mentioning the place where we stayed in Nara because I wouldn't recommend it. Travel can bring you unexpected moments of Serendipity. We met another traveler, Max from Germany, on the way back from the Palace Site in Nara. We waited for the bus together and started to chat. Turns out that he has been studying in Japan and we were curious to know his opinion about the country. It was interesting, especially because he gave me more material for the travel socio-political book that I want to write about this trip. On the other side, when Max mentioned that he has a Japanese girlfriend, we started to talk about long distance relationships and I gave him a piece of advice, based on the difficult past experience with my husband (crazy story told in my first book: "2 Years 4 Months 2 Hours" on Amazon). Even though we spent one hour together the importance of the exchange we shared will stay will us for a long time. This is also the beauty of travel: Serendipity.